…with their reception completing the night under the stars…. …I’m guessing they didn’t picture it being 103 degrees outside! But that’s what they got… and they just decided to roll with it. They didn’t let it ruin their day, they just drank a lot of water and made frequent appearances into the most heavily air conditioned rooms they could find. And their bridal party were troopers as well! Actually it did turn about being OK. They did have a bit of a sweaty ceremony but the beauty of it distracted everyone from their sunburns. 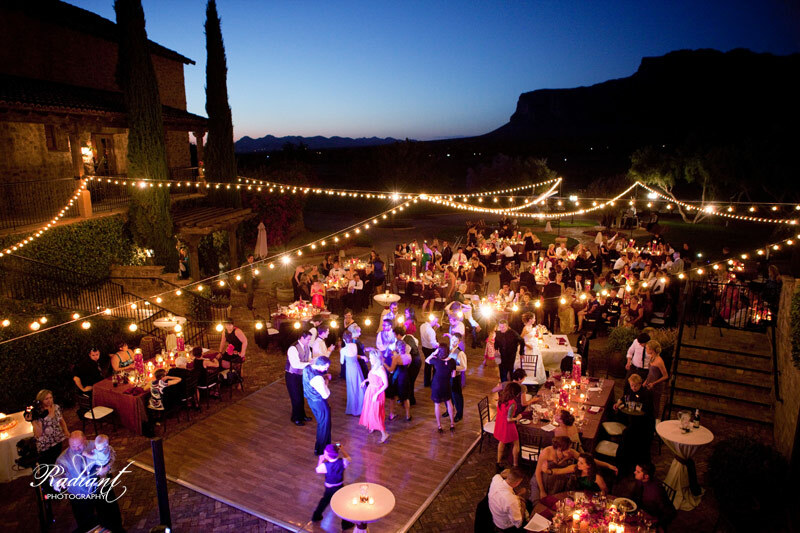 And by the time evening had rolled around the air had started to cool down and their spectacular patio reception turned out to be everything they had dreamed of. They had done it. Megan and Ross had braved the heat, planned a perfect wedding, enjoyed their big day to the fullest, and of course… married the loves of their lives. What more could you ask for out of a wedding?! I have to take a second to talk about their reveal moment, or “first look”. The reason is because just as Megan was getting ready to walk down the aisle to get married, she turned to me and said, “Breanna, thank you SO much for convincing us to see each other before the wedding! I don’t know what we were thinking when we were considering not doing it! I’m so much less nervous than I would be otherwise right now and it made our day so much better to have shared more of it together. Thank you!” And then she headed down the aisle to meet her groom, whom she was no less happy to be seeing for the second time that day! If you’re planning your wedding and you’re still not sure about whether or not you should see one another before the wedding, take a moment to educate yourself about it so you can make an informed decision by reading what Megan read before her wedding, “The Reveal Moment: to have or not to have”. To Ross and Megan: I really am so incredibly proud of how much you guys decided to chill and forget about the small stuff so you could focus on each other and the relationships surrounding you. I’m especially happy you chose to do that because you guys having fun means that we get to have a ton of fun with you! We really enjoyed hanging out with you both and being a part of something so incredibly important to you. Thanks or choosing us and trusting us. I hope these pictures help you remember this day perfectly for the rest of your lives! Click to see the rest of Ross and Megan’s Sunny and Happy Wedding day photos. In honor of Katy and Shaun’s Hawaiian wedding being featured on Style Me Pretty Destinations today, I’m re-posting the original blog entry about their Sept. 5, 2010 wedding. 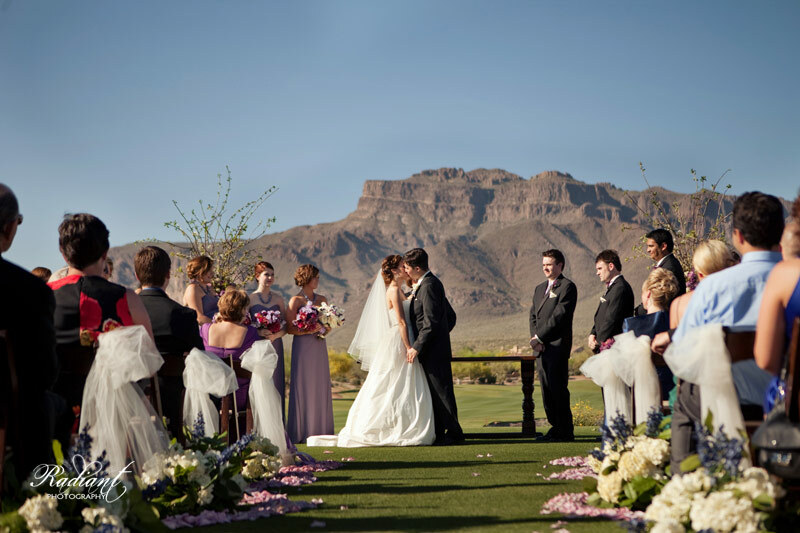 This is still one of our all time favorite weddings with one of our all time favorite couples. So if you missed this the first time around, today is your lucky day! Click here to see blog posts about Katy and Shaun’s pre-wedding day events, Groom’s dinner ON the USS Missouri battleship, and their trash the dress session the day after the wedding. Or just continue reading here to take a trip down memory lane to their wedding day…. You’ve now finished the appetizers I’ve been feeding you about Katy and Shaun’s wedding week and are ready for the main course… the wedding day. By now you’ve read about Katy and Shaun and you’ve seen the heart they put into planning their wedding week (if you missed all this, read part 1 and part 2) for their friends and family to enjoy so you know to expect nothing short of amazingness, in all it’s glory, on their wedding day. And you’d be quite right to expect that. No beauty was spared, no creative ideas left untouched as Katy and Shaun put all the details into their big day. Everything from big to small was perfect. (Instead of flower girls and ring bearers, they had the kids at the wedding hand out leis to the guests as they arrived). I’m sure some of this perfection came from their perfectly wonderful wedding coordinator, Melissa Laudise with Let’s Do This! Event Planning and Coordinating. We had heard a ton about Melissa long before it was even time to head to Hawaii. Katy and Shaun were absolutely thrilled with her… as were we once we got to meet and work with her! She was so easy to work with and she was the perfect combination of relaxed and organized… in short, we have a professional crush on her. Her arrangement of all the sentimental and beautiful details that Katy and Shaun wanted included in their wedding was pulled off flawlessly, and she did it all with a casual kind of grace that can only be described as “Hawaiian Class”. Melissa lives in Hawaii but she travels for weddings! So no matter where you live, if you still need a coordinator for your wedding day, give her a call! As you can see, the Kahaluu fishpond that Katy and Shaun got married on, also had a part to play in the beauty of the wedding day. I can’t believe how perfectly this place seemed to fit them. … sort of like Katy herself! I have to say that when Katy put on the wedding dress I absolutely lost my breath for a second! She somehow managed to still look like herself, but also just like a Hawaiian princess! I’m not kidding, the entire day I couldn’t get over how beautiful she looked, I’m sure her face radiating happiness the way it was had a lot to do with it! …and I’m sure it’s a moment that neither will ever forget. Since we loved the house so much, we went ahead and did all the group photos around there as well. (Someone shouted the cue and before I knew what was happening, they’d spelled out “Katy” with their arms! Ha ha!). Once it was time for the ceremony, Katy pulled out all the stops by surprising her guests and coming across the lake on a canoe (that was being paddled by 2 of the groomsmen… who are obviously very trusted and have very good balance!). (He’s eagerly awaiting the arrival of his beautiful bride from across the water). Since I (Breanna) knew the canoe entrance was coming, that wasn’t the most surprising part of the ceremony to me… what was surprising was how emotional I got throughout the whole thing! It was one of those times where I was constantly checking the viewer on my camera to make sure the mist from my eyes wasn’t fogging it up. I just know how excited they were about every single little part of their day since we’ve been talking with them about it for so long now. During the very first phone call we ever had with them, Katy and Shaun took great care to explain in detail, how much they wanted their wedding to be about joining them together before God and about the great love they shared with each other and with all the people surrounding them. For as excited as they were about the actual wedding and reception, they were even more excited about the meaning behind it all. The location of the ceremony and reception couldn’t have been better… with beautiful tents set up for dinner, complete with my dearest decor love… white lights strung across a night sky. I’ve always dreamed of having the perfect nighttime garden party… and I think Katy and Shaun nailed my own dreams on the head! The cocktail hour area was stunning as well, with a magnificent view of the lake and couches to sit on while you stare at it and talk to your friends, it was the whole package. During this chill hanging out time guests were not only munching on amazing appetizers (called Pupus there), but also filling out postcards to mail to Katy and Shaun sporadically once they return home from their honeymoon. So they can look forward to getting different postcards from their wedding guests for a long time after their wedding day. How fun is that?! This idea is courtesy of Melissa’s special touch. …but I felt like they were incredibly insightful and exceptionally beautiful. I also heard one of the funniest speeches I’ve ever heard as one of the groomsmen read out loud a letter Shaun wrote him when he was in Jr. High. It was hilarious and such a great idea! During the speeches, it started raining. But don’t worry, instead of taking away from the perfection of the day, it actually made it better! In Hawaii, rain on your wedding day is considered good luck and Shaun (who lived in Hawaii for awhile growing up) was really hoping they’d get “the blessing”, but he also didn’t want it to spoil any of their plans. So after the 20 min. of rain we got, he was SO excited that they had some rain but not too much! (and Scottie was so excited he had the chance to get these amazing nighttime rain shots!). Pretty soon it was time to start the party! Katy and Shaun had hired a super talented and very fun band and their guests took full advantage of this excellent dancing music that was there just for them. Everyone jumped right in and the energy that flowed from the band to the guests was very high! Katy and Shaun’s first dance was amazing too by the way, it was to a very fun and jazzy number and they busted out with some moves I didn’t know they had in them! Towards the end of the night, the big surprise we’d been waiting for finally came… Shaun and his band got up there to sing a song dedicated to Katy (read about the coolness of their band in this post here). They sang “Just the Two of Us” (no, not the Will Smith version!) and there is no less cheesy way to describe this song than as a magical moment. It just was. The ebb and flow of the musicians, the excitement of their guests, and the happiness of Katy and Shaun made it all more than complete. It was definitely unforgettable. (this was taken when everyone was cheering on Shaun and the band… so cool. Like our Facebook page if you want to tag yourself in some of these photos.). As the guests cleared out of the wedding, they weren’t too sad that it was over because for many of them it wasn’t! Katy and Shaun had planned an after party at a local restaurant where they had hired another musician as well. We spent the night dancing away and laughing and talking with all their fantastic friends. We don’t have any after party pictures because Katy and Shaun talked us into not bringing our cameras so we could truly relax. By the end of the night, we were so thankful that we listened to them because we had more fun than I can remember having in a very long time! (Katy and her mom… about to walk down the aisle together). (Shaun with is 90+ year old grandmother who was such a trooper and made it to many of the pre-wedding events as well as the wedding!). (Shaun giving his nephew- also named Shaun- one of the coolest challenges I’ve ever heard). Actually, this entire experience in Hawaii with Katy and Shaun and their guests is pretty unforgettable. I can honestly say with confidence that it was one of the best weeks of Scottie and my lives and we are so thankful we got to be a part of it all. Thank you Katy and Shaun for being the loving, relaxed, gracious, and fun people that you are. We not only enjoyed all aspects of your wedding week, but we can’t imagine spending it with a better couple. You both are very unique individuals and we’re so glad that you’ve joined forces to create the beautiful “collective dream” that you are working on. We love you both and we’re excited to come visit you in CA soon! Click to see the rest of the photos from Katy and Shaun’s wedding! For reals! Whenever we (Josh and Kelley) book any kind of a baby session, I (Kelley) usually start jumping up and down, dreaming up shot ideas, and blabbing Josh’s ear off until the shoot is over. AND the most adorable two year old little girl that you’ve EVER seen! That’s right folks, two babies (well, I’m counting toddlers as babies here) in ONE session! WIN! When Josh and I arrived, little Isaiah was pretty tired, so we started by getting some sweet sleeping newborn shots. Now, as you may have heard, it’s best to take newborn photos within seven days or so after the little one is born. The reason for this is that after that first week, the baby starts to become more alert, awake, and WAY less happy about posing for photos. While Isaiah was a couple of days past that one week mark on the day of this session, he slept just long enough for us to get some great sleepy shots! And of course some daddy daughter time. Then, right around the time everyone else was running out of energy, it was time for two year old Mikayla to shine (leave it to a two year old to be full of energy when everyone else is winding down). She pumped everyone else up as she danced to Van Halen’s, “Jump” (courtesy of her dad’s phone) and twirled in a shower of countless bubbles (courtesy of dad and a bubble wand). Thank you Campbells for letting Josh and me help you document this important new chapter in the life of your family. Your “New Addition” is already such a blessing to those around him, which is why we know he will fit PERFECTLY into the Campbell family. Morgan is back and ready for graduation! You may remember her from her super fab, black and white sweet 16 party back in the day… well now Morgan is back with her cap and gown all ready to go! That’s right, she’s all grown up and graduating! She apparently survived that crazy thing called high school and is ready to move on to see what the wonderful world of college has in store for her! Morgan my dear, you are going to have so much fun! I (Breanna) can’t even tell you how happy we were to get the email saying that Morgan was ready for her senior pictures! It is seriously so cool to get to be involved with such an awesome girl during all the major events in her life! Is something good going on in Morgan’s life? Oh, looks like we get to go hang out with her and celebrate again!! So Morgan rolled up in her Mustang (that we got to witness her getting as a gift for her 16th birthday!) and we headed out into the trees to get some farewell to high school photos! (obviously we left the trees eventually in favor of some dirt!). Morgan chose a great spot for pictures (on private property so I can’t tell you where it’s at!) and brought along her mom and sister to be her slaves, I mean “assistants” to help her carry stuff and provide a little comedic relief to help us get some laughing shots. A special thanks to Morgan for bringing us along once again into this new stage of your life. Your excitement and smile are totally contagious, so we are always happy for the opportunity to be around you and to help you commemorate the major milestones in your life! We can’t wait to see what’s next for you! Congratulations on graduating and good luck in college! (Click to see the rest of Morgan’s senior session photos). Can I (Kelley) just start off this post by saying that senior sessions are incredible?! I mean let’s be honest and just state the fact that teenagers will always be about a billion times cooler than me. Exhibit A: Luke. Enough said. Even when I was a teenager, teenagers were cooler than me. And that “coolness” always seems to shine through in photos and make for some amazing shots! Now, for those of you that don’t know Luke, get to know him. I mean right now! Josh and I spent over an hour taking his photos, chatting with him, and just getting to know him. He’s pretty darn awesome! We also learned a few things about Luke from his mom and dad who came along for the shoot. For example, Luke likes to sit on things. I know, I know, random right? But apparently sitting anywhere and everywhere is a real talent of his. In fact, Luke and his family recently took a trip around Italy (yeah, I’m jealous too!) and they all joke that it was Luke’s trip of Italian things to sit on. Naturally, we had to grab a few shots of Luke just sitting around. We also heard that Luke was a pretty skilled jumper. And, while Josh and I are pretty tough critics when it comes to jumping (we have some pretty mad jumping skills ourselves), we give Luke a solid 10 out of 10! In the fall, Luke will be starting classes at ASU (see, I told you he’s cool… Can you tell Josh and I are ASU graduates? ), and I’m sure he will do wonderfully. Not only am I sure that he will do well in his classes, but I’m predicting that he will also be great when it comes to sitting on and jumping off all sorts of things on campus. But in all seriousness Luke, thanks for letting Josh and me help you and your family document this important milestone in your life, we had a blast! Congratulations on graduating and good luck with your future at ASU. You’re going to be GREAT!